Baranof Fishing Excursion's resource on Ketchikan sportfishing techniques. When salmon are concentrated around a bait ball, or congregating to spawn as in June with our spectacular Herring Cove run, jigging is an extremely effective method to catch salmon. Of all techniques used for salmon, jigging is the most demanding. The success of the angler is dependent upon locating the salmon and also upon manipulating the jig properly to elicit the strike response. Jigging is much more like hunting than other methods. The angler, after detailed instruction by their Baranof guide, briskly works the rod up, then down to the water's surface, causing the jig to turn over and flutter erratically downward, mimicking the action of a stunned and wounded baitfish. For the world class salmon fishing in Ketchikan waters, trolling remains the single most productive method of saltwater salmon angling. Even with trolling, knowledge of our local waters to locate salmon is still essential, as fish concentrate in certain areas such as Mountain and Survey points for feeding and migrating. The downriggers used on Baranof boats for trolling allow for multiple lines to be fished at various depths off the back and sides of our boats. Presenting a cut plug herring or lures at a proper depth and speed, and with the right action to elicit response from salmon is the primary fishing method for Kings. Once the Silver and Pink salmon are running at full swing mooching or jigging may be the appropriate approach as the sheer numbers of fish make the use of trolling downriggers cumbersome. The real art of trolling is in the rigging and presentation. The use of flashers and scents are common ways of bringing fish in from distances. Having the proper movement of a whole herring, cut plug, or lure is critical. The art of the cut plug or rigged herring having just the right spin or wobble when pulled through the water can quite often be the difference between catching your limit, or returning home skunked. Mooching for Salmon is one of the most effective fishing techniques in Southeast Alaska especially in the waters surrounding Ketchikan. When mooching each angler is provided a salmon pole of medium to moderate action and a Penn reel with line counting capabilities. With brief bursts of power from the trolling motor your Baranof guide strives to keep the line at a 45° angle from the rod. Each angler works the herring cut plug as they reel at slow to moderate speeds to provide action to the bait. 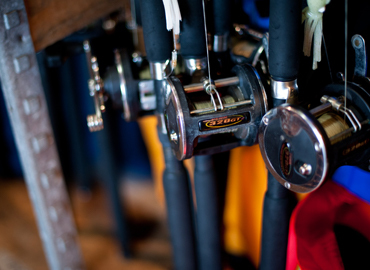 By alternately "free spooling" line out and subsequently reeling, the angler can effectively cover the desired portion of the water column. Optimally your guide will mooch with the drift to keep the lines parallel to the boat, providing the best presentation to the Kings and Silvers that normally face into the drift. Of virtues required for mooching, patience is paramount. When mooching it is a mantra among Baranof guides that a guest MUST NOT set the hook while the salmon is biting as, often times, a salmon will play with and mouth the bait before engulfing. Our guides, therefore, continually preach not to set the hook until the rod loads. Fish don't just jump into the boat. You have to catch 'em. And when you're dealing with wily salmon, you've got to do more than just dangle a little bait in the water: You've got to make them believe they're chasing something potentially delicious. In essence, you've literally got to lure them onto the hook. 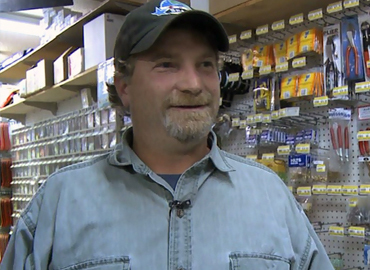 "We have to outsmart 'em on a daily basis," says veteran Ketchikan fishing guide, Clay Slanaker, "and we've got all kinds of toys to help us do that!" Spoons, flashers, hoochies. What works best? "Well, they're all very effective," says Slanaker, "depending on the day ... the depth you're fishing ... the tides ... what species of salmon you're fishing for ..." Spoons? They're small metal lures that imitate herring and baby cod. If there are a lot of codfish in the area, says Slanaker, you'd choose a spoon with a gold back and a white belly - in essence, one that will blend in with the crowd. Flashers are thin sheets of metal, about three inches wide and a foot long, that are designed to weave through the water, catch the sun and trick salmon into thinking there's another fish feeding nearby. When used in conjunction with hoochies (i.e, imitation squid), flashers wobble in the water making the imitation bait appear to come alive. 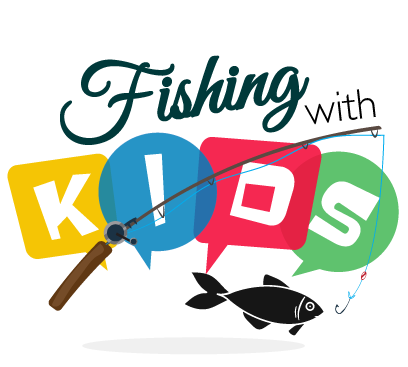 There are, literally, hundreds of different kinds of lures, which can be used in a thousand different combinations. The only "right combination" is whatever gets the fish to bite, says Slanaker. "It might be the ugliest lure you've got, but if it's catching fish, it's a beautiful thing!" First off the Ketchikan Halibut fishing regulations improved dramatically for 2014. The 2011 season saw the International Halibut Commission imposing a limit for Southeast Alaska of just one fish no longer than 37 inches (Effectively a halibut no bigger than 22 pounds). Regulations for area 2C (Southeast Alaska) for 2014 increased the size limit to 44" (40 lbs) or a trophy halibut over 76" (234 Pounds). We anticipate that 2015 will still see us with a one fish per day limit for non-residents and no seasonal limits. Halibut fishing in Alaska could be considered an art form as far as we are concerned with no two guides applying their skills in the same way. That being said, after running 30 to 45 minutes to our fishing grounds you will be either jigging for halibut (especially if sand sharks are moving through) or using herring or pink salmon for bait. When you arrive onsite quite often your guide will begin a drift across the halibut grounds to prospect for fish concentrations. If the tides or wind make drift fishing difficult anchoring can be a very productive waiting game. Anglers' baits alone establish a scent trail that leads halibut to the hook. Your Baranof guide will ask you to free spool your jig or bait to the bottom with a thumb-controlled fall. When you reach bottom, engage the gear mechanism and crank two or three turns. Set the drag at 2/3rds tension so that the line will barely release. Hold the rod horizontally and gently undulate the bait by raising and lowering the rod tip. Gentle lifts and drops, punctuated by an occasional dramatic upsweep, are more effective and less tiring. Keep the bait within three feet of the ocean floor. 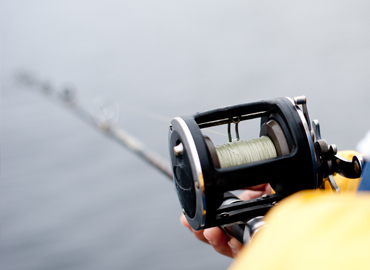 If jigging, raise the rod to lift the lure two to four feet, then allow it to drop while keeping constant line tension, since bites usually come on the fall. Most halibut bites start as gentle tugs or nibbles. If using bait our guides normally advise giving slack line by dropping the rod tip to a 45 degree down angle. Wait a count of ten. If the fish puts immediate heavy pressure or runs with the bait, you needn't wait the full count. If the fish doesn't tighten the line, lift the rod gently with your thumb locked against the reel spool until you feel solid weight and/or a headshake. Set the hook with a short, hard strike. Don't lift the rod up past 45 degrees on the set, since this can create stress that could break either the rod or your rigging. Once you have set your hook, hang on!... your halibut will normally make a run for it. Lower the rod tip and lighten the drag so that the line doesn't break. 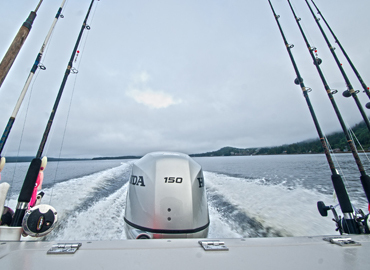 Sometimes your guide will need to maneuver the boat to follow a big halibut. Only when the fish stops should you retighten the drag and begin to bring it in with a pumping action. Lift the rod without reeling then reel down to take out the slack. Try to keep tension against the fish at all times. We really try to get you to enjoy the process of fighting and retrieving your halibut. By taking your time fighting your fish it is less wear on you, and your gear, and it is much safer to boat a halibut when it's tired.